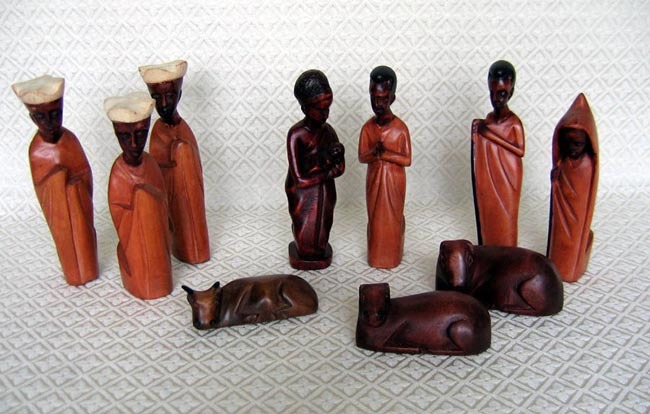 This Nativity was carved from light jacaranda wood by an artisan named Dieudonne. He works in Bujumbura, Burundi. Dieudonne and few others make wood crafts in a small village area. Their carvings include wall hangings and banana-leaf pictures. They also make drums. The set contains 10 figures: Joseph, Mary holding baby Jesus, two shepherds, three cattle, and three wise men. The Joseph figure measures 7 inches tall.